Park Farm Black Under 13s are pictured before their Hereward Cup semi-final win obver Whittlesey. From the left are, back, Sam P. Baldowski, Kadan Al-Gharabally, Tom Barton, Gerson Reis Sami, Daniel Sol, Gediminas Kozik, Lacko Stanislav, front, Ben Lane, Peter Duda, Joe Marshall, Dominik Chrominski, Robert Facuna, Mikolaj Burnac and Lucas Bridden. The Under 13 Hereward Cup final on April 17 will be an all-Park Farm affair. 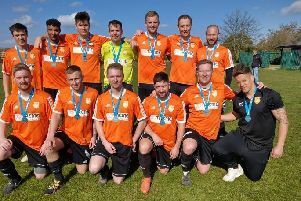 Both Park Farm Red, the Division Three title favourites, and Park Farm Black, the Division Four champions, were semi-final victors on Sunday. Whittlesey Under 13s are pictured before their Hereward Cup defeat by Park Farm Black. From the left are, back, Mark Ashkettle, Scott Ashkettle, Christiano Verde, Jacob Burley-Muffet, Joseph Potter, Teddie Bailie, Jake Redhead, Gary Horn, front, Brandon Westgarth, Brandon Furneaux, Taylor Letch, Ellis Horn, Ben Schulze, Kaish Joseph and Jacob Sauer. Park Farm Red beat Werrington Red 4-0 with goals by Liam Nightingale (2), Callum McAuley and Riley Deadman, while Park Farm Black beat Whittlesey 3-1 thanks to Kadan Al-Gharabally, Peter Duda and Gediminas Kozik. Alconbury cruised into the Under 13 League Cup final when smashing Yaxley 5-0 in the first semi-final with goals by Harrison Radwell (3), Bailey Baker and Connor O’Donovan. They will meet the winners of this Sunday’s second semi between Hampton Blue and Feeder in the April 17 decider. On the county cup front, this season’s Under 12 Lincs Cup final will be betwen two Peterborough Junior Alliance League sides. In Sunday’s semi-finals, Deeping Blue won 3-0 at Brigg Town while Baston won 3-1 at home against Fernwood Foxes. A date and venue for the final has still to be arranged.